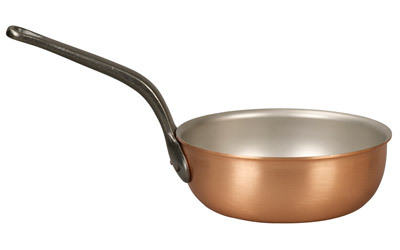 Falk 20cm Copper Saucier is fast becoming my 'go to' pot for cooking because it is the perfect size and amazing to use. 433 customers found this review helpful. Did you? Yes, I did! What can I say? Among the best pans I have used, perfect weight, size and feel! Would recommend in a heart beat! 502 customers found this review helpful. Did you? Yes, I did! A go-to pan for so many things rice for 2, soup, scrambled eggs and of course sauces. 669 customers found this review helpful. Did you? Yes, I did! My neighbours arrived for my pans maiden performance, in a garden setting. While everyone was sat, dipping in, mega chunks of sourdough bread into the rich melted cheese sauce. I had another moment and used my Falk 18cm saucier pan and made a quick chocolate sauce in that pan, this was set out with a platter of fresh fruit. The concept was a fantastic success. The shape of the the Falk pan, the quality of Falk cookware is second to none. It's used practically every day and has fitted in so....well, along with my others purchases from Falk. I didn't have to research copper cookwear online for very long before I saw the common theme of people raving about Falk Culinair. I bought this item as part of the Starter Set, a great combination of products that helped us to start our collection! The quality is perfect, which can be felt by the weight and sturdiness of the item alone. The perfect finish of each product, superior cooking (due to even heat transfer) combined with excellent customer service and super fast delivery made for a very pleasant purchase overall. I'm looking forward to using these pans for many years to come and would 100% recommend Falk Culinair's product to anyone in the market for top notch copper cookware. 601 customers found this review helpful. Did you? Yes, I did!